In the last week we have enjoyed incredible South African Lamb. It has to be some of the most flavorsome and meltingly tender lamb available in the world! I think the only comparable lamb is found in countries like Greece and Turkey where the animals get to graze a lot of natural and aromatic herbs like wild sage. 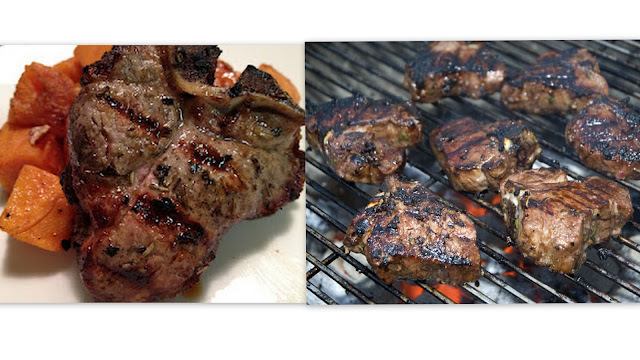 My wife Angie, cooked such a simple, delicious meal of lamb chops last night, that I am inspired to record it here, as well as the barbecued version I did over the last weekend. All she did was place them in the oven, close under the grill for 30 minutes. I detected a dash of freshly ground black pepper. She served it with Mashed Butternut squash and fried potato cubes and it was really awesome. It humbled me a little because it reminded me that sometimes we tend to "overwork" our herbs and flavors. With the same batch of Lamb Loin Chops, I put together a barbecue, or braai as we call it here in Southern Africa. Mt lamb chops were sprinkled with chopped rosemary, freshly ground black pepper and a sprinkling of balsamic vinegar. This was then braaied over medium coals (strictly no flame) for about 10 minutes each side. They were INCREDIBLE! We ate them by the fireside with freshly roasted sweetcorn. Just that. Oh yes - they both look so good, You're right, we do tend to overwork the additions to good food sometimes. Two great meals - I'm envious. Yep like I said. Felt embarrassed by its simplicity and unique flavors! Mmmm... I looove the look of these chops and the more simple they are the better the flavour is! IF the lamb is good! BIG if!! I was lucky..
must say your blog loads a lot faster then most. hosting company? My personal email is: theda_foss@web.